After a recent "photo shoot," my children spent so long playing with the bed sheet that I determined I needed to bring out a sheet occasionally just for play. (They always have access to blankets, but the white sheet was more enticing.) 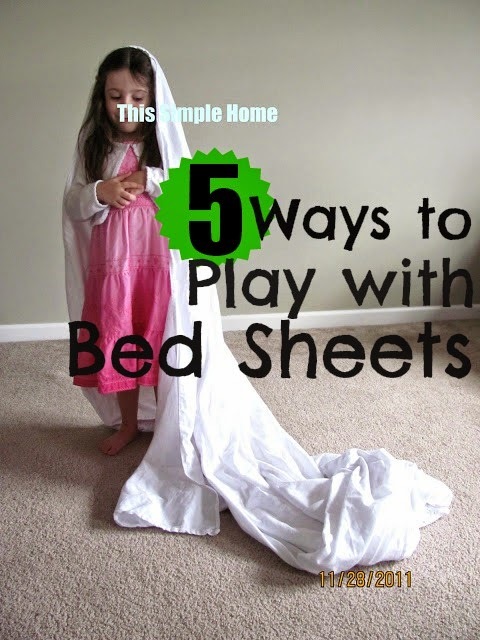 Below are just a few ideas for bed sheet play to get your child's creative juices flowing. One of the simplest joys from childhood might be making a tent in a living room with a sheet and hiding out all day. Don't forget story time in the tent! Or the joy of giggling with your siblings. Whether the sheet is draped over kitchen chairs or larger furniture, a tent is sure to be a hit! Create the same fun of parachute play at home using a bed sheet (or blanket). If you have only one child, use a baby or crib sized blanket. Three people (one being an adult) can handle a full size bed sheet! Bounce a stuffed animal "friend" or ball on the parachute. Play big kid peek-a-boo. Consider these other ideas for parachute play, too. With no encouragement, my daughter became this bride with our white sheet. A bed sheet is large enough to help older children play "baby." Children can swaddle one another and take turns caring for one another. It is amazing the monster sounds that can come from a bed sheet-especially when it is a double-headed monster! And when the children are tired from all of the bed sheet play time, have a bit of rest...or pretend to. Though much of this bed sheet play can be done without parents, it is truly just plain FUN to experience it with your child. How would you play with a bed sheet? I used to play with bedsheets. I should dig out some I was going to toss for "play." Thanks for the idea. It's on my list of fun things to do this summer on rainy days, too! My kids love building forts and making themselves into "burritos" with sheets. So wonderful that something so simple can inspire such imagination. My oldest will ask to be wrapped up as a baby burrito! Oh such great memories I had with my bed sheets! I use it for my tents and also used it to imagine I had long flowing hair. Ooo...the hair is a new one for me! I love anything that entices kids to use their imaginations! As old as I am, I still remember building "forts" with sheets when I was younger :-) Fun memories to be sure!! Simple playthings are the best!